No surprise here, really. Peter Jackson, director of The Lord of the Rings trilogy and the two The Hobbit films, wants to add a third chapter to The Hobbit. Thus, completing two trilogies (cough, Star Wars, cough). Not that this is necessarily a bad thing, because it isn't. In fact, I think it's a wonderful idea. Peter Jackson is looking to return to Middle Earth yet again. 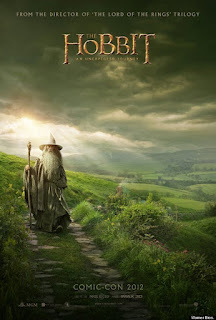 Sources close to the production of The Hobbit say the filmmaker has concluded that he wants to turn his upcoming two-film adaptation of the J.R.R. Tolkien epic into a trilogy. That would require additional shooting that sources say could take place next summer for about two months in New Zealand. Jackson teased the idea at Comic-Con on July 14, telling fans that he wants to shoot more footage. But since then, sources say that studio Warner Bros., Jackson, producer Fran Walsh and writer-producer Philippa Boyens began exploring the logistics of what it would take to make another movie. Those talks are said to have accelerated in recent days, with the studio on board if the right financial arrangements can be achieved. That includes securing new actor deals for the expansive cast as well as shoring up certain rights associated with the property (The Hobbit has a long a tortured rights history.) “If we’re going to do it, we have to make a decision soon," says a source close to the production. "It’s strongly driven by the filmmakers’ desire to tell more of the story.” The first installment, The Hobbit: An Unexpected Journey, is set for release on Dec. 14. The second film, called There and Back Again, is set to hit theaters on Dec. 13, 2013. A third film would presumably follow in 2014, much the same way the films in Jackson's Lord of the Rings trilogy unspooled over three consecutive years. “It’s about taking the chance to tell more of the incredible tale with the cast we have assembled," says a source.